New Kaitou Sentai LupinRanger VS Keisatsu Sentai PatRanger Scans: PatKaiser Strong, Lupin Kaiser Strong, and Lupin X teased! 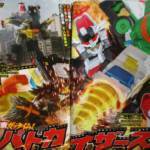 This month’s exciting new magazine scans for Kaitou Sentai LupinRanger VS Keisatsu Sentai PatRanger have been making the rounds online, courtesy of Rangerboard and some translations via SpecialForm12 via Twitter. -New Trigger Machines added to the PatRanger’s arsenal: Trigger Machine Crane and Drill can combine to form PatKaiser Strong, similar to the Scissor and Blade dial fighters of the Lupinranger’s. -Various pieces of the elusive Lupin Collection are highlighted, and it’s mentioned that only Kogure knows their true purpose and something happening when all pieces are gathered. –Lupin X was also highlighted in this scan. He’ll be joining the fight against the Ganglars in next month’s batch of episodes!